Mother's Gift Circle Baby Item & Clothing Drive - nurture. At any given time hundreds of Richmond teenagers are facing the challenges of pregnancy. In addition to pregnancy’s inherent difficulties (exhaustion, anxiety. . . you know the list), these girls’ burden often includes shame, poverty, and violence. Friends of Nurture is organizing a clothing/item drive to help lighten the load for these young mothers. 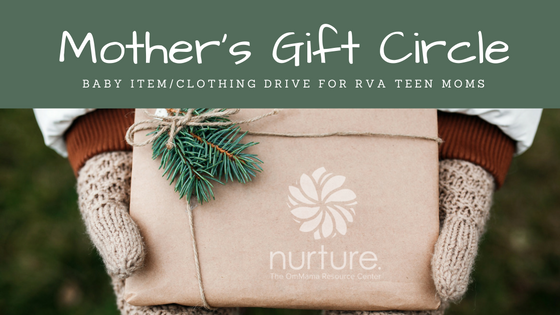 Mother’s Gift Circle collects, wraps and distributes gifts to teens enrolled in the Richmond City Health District’s Resource Mothers Program. These presents spread joy and help keep girls involved in a program that educates them about prenatal health, caring for newborns, birth control and the importance of staying in school. Questions? Call Nurture board members Cait at 215-767-4352 or Janina at 770-862-0311.